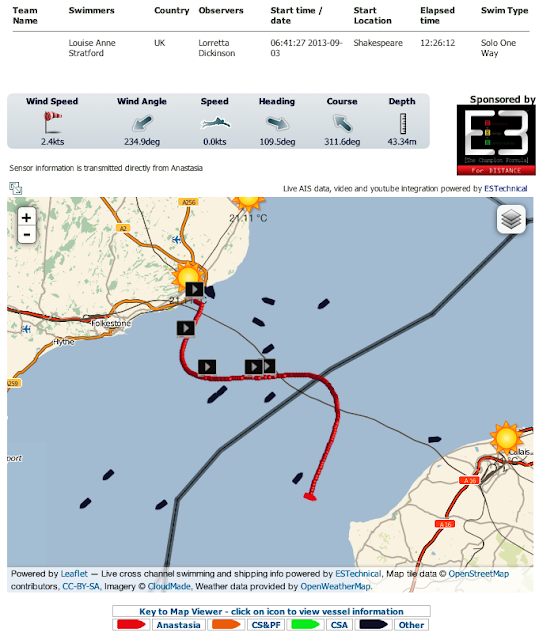 www.HoffySwims.com: A huge congratulations to Louise Stratford, 2013 English Channel Swimmer, from all at Body and Mind Studio! 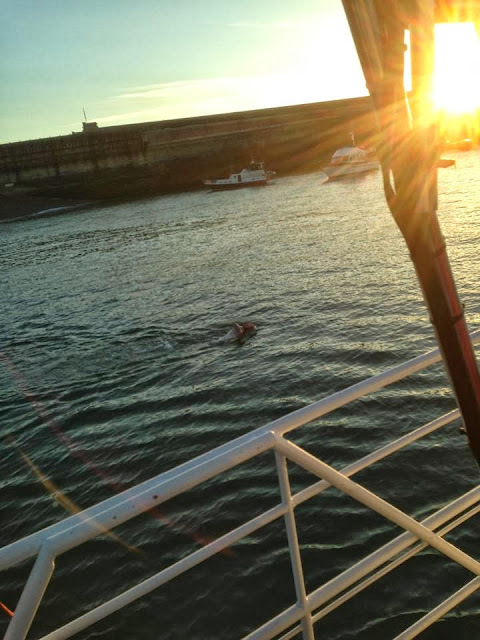 A huge congratulations to Louise Stratford, 2013 English Channel Swimmer, from all at Body and Mind Studio! 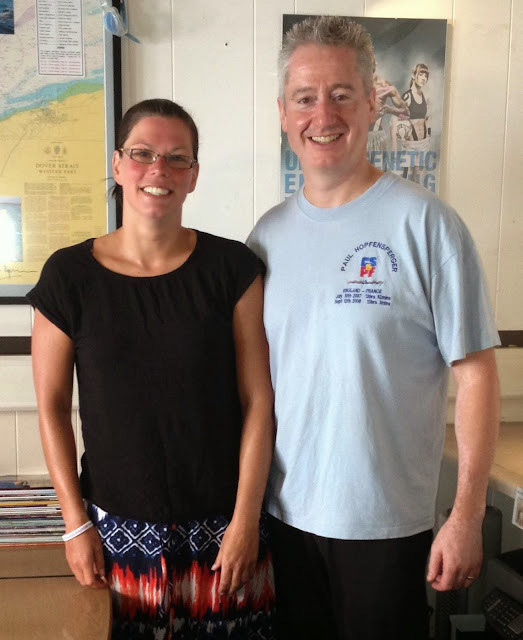 Above: 2013 English Channel Swimmer, Louise Stratford with Body and Mind Studio's Sports and Advanced Clinical Massage Therapist, Paul Hopfensperger, less than 36 hours after her epic 17 Hour 9 minute swim across The English Channel on September 03, 2013. 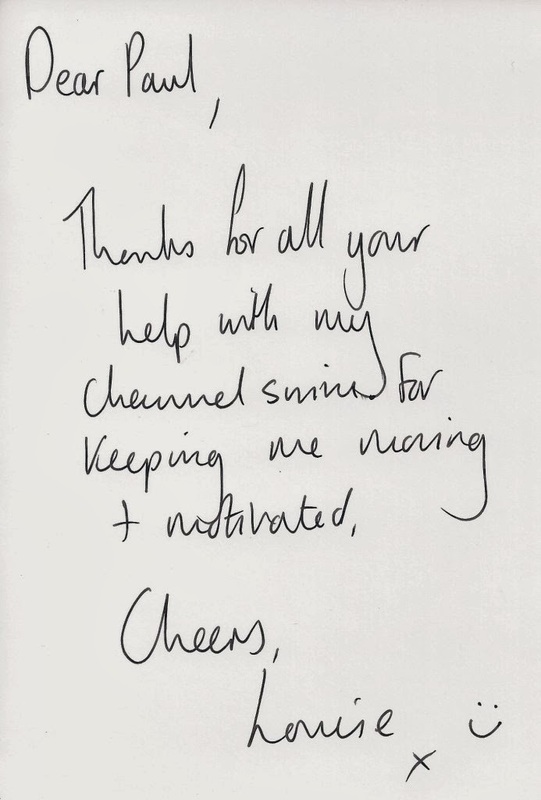 I first met Louise when she telephoned to book a massage with us on February 20, 2012. We had been recommended to her by multiple channel swimmer and Channel Swimming and Piloting Federation President Nick Adams. Louise told me that she had been training for about 1.5 years and had completed many open water events. Over the past 1.75 years, I have had the pleasure and the honour of treating Louise with both Advanced Clinical Massage and Sports Massage as well as giving her tips, motivation and some advice from my own personal experiences as an open water swimmer. At 06: 41 Hrs on the morning of September 03, 2013, Louise set off from Shakespeare Beach in Dover (pictured above) on her epic journey to France. 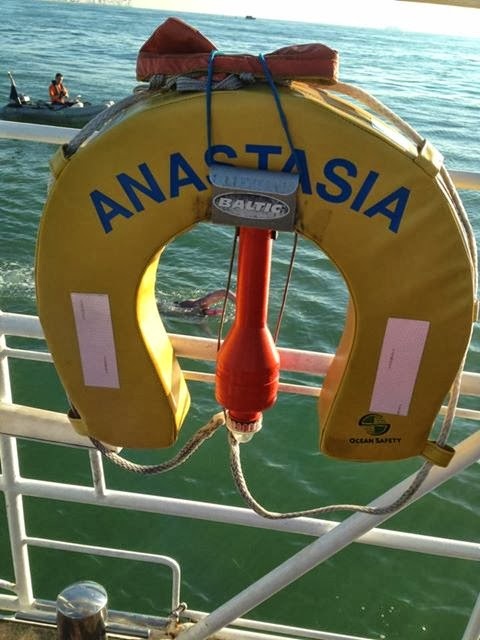 During our last pre-swim Swedish Massage treatment I had given her one of my most important pieces of mental advice for any Channel Swimmer to succeed. 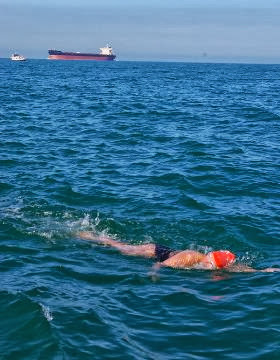 Advice which had been give to me in 2007 and most certainly got me across both of my two English Channel solo swims (want to know what it was - then come and see me!). I followed her all day via the Internet and it was a very emotional and exciting experience to watch her progress throughout the day! 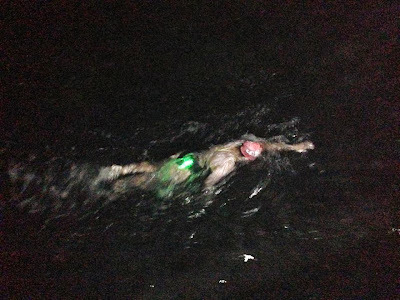 12 hours and 26 minutes into the swim and with night starting to fall, having been across this stretch of water quite a few times now as both a swimmer and crew member, I could see exactly what was happening. I could see that the swim was going to go on for a few hours yet! This is where the advice I gave her would possibly help her. Above: Louise Stratford swimming strongly in the dark of night just off the coast of France near Cap-Gris-Nez. Eventually, at just before midnight, a comment on her Facebook page read "Has landed! and running up the beach!". I was totally ecstatic for her! An awesome swim by an awesome swimmer in 17 hours and 9 minutes to become a member of The English Channel Swimming Club! 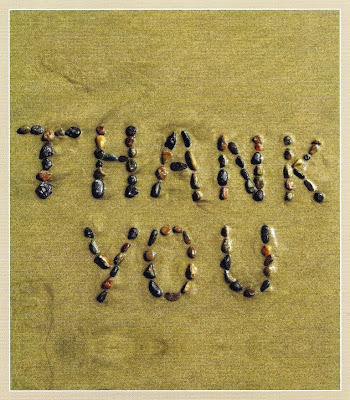 I was delighted to receive a "Thank You" card from Louise. No thanks needed Louise, you are an amazingly strong person both mentally and physically, and I am proud to have been able to help you in a small way. The hard part you did all by yourself. Well done and welcome to the club! 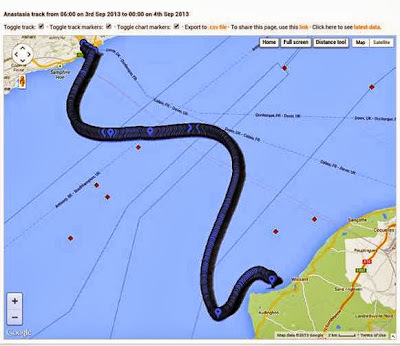 If I can help anyone else who is thinking of swimming The English Channel, please do not hesitate to contact me. Contact details can be found by clicking here.